Automatical 90W Household Mini Vacuum Sealer Food Preservation Machine + 15 Sealing Bags Kitchen Tool by Gogil at Freedom from Government. Hurry! Limited time offer. Offer valid only while supplies last. Help you to reduce spoilage and waste, save more. Keeps food fresh up to five times longer than ordinary storage methods and prevents freezer burn. View More In Vacuum Sealers. Help you to reduce spoilage and waste, save more. Keeps food fresh up to five times longer than ordinary storage methods and prevents freezer burn. Put the items inside the bag. Clean and straighten the open end of the bag, clearing away any dust and smoothing out wrinkles or ripples. Place the open end of the bag in the vacuum chamber beneath the air intake. Do not overfill the bag. Close the lid and then press on both sides of the lid, and lock the buckles. Press the "Vacuum & Seal" Button and the green LED will blink, the bag will be automatically vacuumed. When the LED turns to be red, the bag will be automatically sealed. When the LED turns to be green again, the process is completed. Open the vacuum releasing valve and release the vacuum pressure inside the machine. Open the upper lid and take out the bag. Refrigerate or freeze sealed food bag if needed. Plug the appliance into a power source when the green LED light up. Put one end of the bag on top of the sealing strip, but make sure the end does not enter the vacuum chamber. Close the lid and then press on both sides of the lid, and lock the buckles. Press the "Seal Only" button for 3 seconds, and the LED turns to be red. Then press on both sides of the lid until the red LED turns to be green again. Sealing is completed, open the upper lid and take out the bag. 100% GOOD QUALITY FAST SHIPPING. IF YOU LOVE IT, DON’T MISS IT. Compact Vacuum Sealing System eliminates dry and hardening food, reduces spoilage and food waste. Fresh, anti-bacteria, moisture-proof, mold-proof, antioxidant. 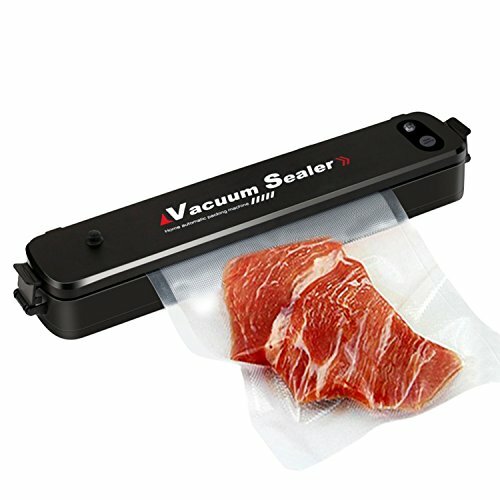 One touch vacuum sealer operation, easy to use. Low noise, low vibration. Portability and ease of use: The product of mini size of 14.2 x 2.1 x 1.97 inches is portable for outdoor picnic and storage at home. Made from eco-friendly ABS material, it is light in weight and easy to clean. Seal food in seconds, and keeps food tasty and fresh up to 5 times longer, protects food against freezer burns. Suitable for both moist and dry food. Easy to operate, has an easy to understand control panel and saves countertop space with its compact design. Package Include:1pcs Mini Vacuum Sealer + 15 Sealing Bags. Present 15 bags (25 * 20cm / 9.84 * 7.87in) for free. If you have any questions about this product by Gogil, contact us by completing and submitting the form below. If you are looking for a specif part number, please include it with your message.